DataSpaceUK Ltd Supported 2 Great Local Events this summer. Home/Blog/DataSpaceUK Ltd Supported 2 Great Local Events this summer. 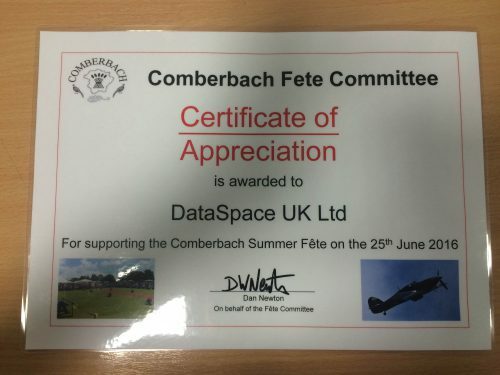 DataSpaceUK Ltd have Supported 2 Great Local Events this summer. Comberbach Fete on Saturday 25th June. Comberbach village Fete celebrated its 70th year this year!! The Parade was inspired by the Rio Olympics and as usual commenced from Senna Lane at 1pm then proceeded through the village to the Show Ground for the Fete to start at 2pm. Where the crowning of this year’s Comberbach Rose Queen. The fete included live music from ‘Liv Queenie, The Bostock Band and No Room for Parachutes’. As well as ‘The Hurricane’ Fly-by dancing, fairground rides, ice cream, stalls, farm animals, games, tombola, bottle stall, show ring, fancy dress, food and drink, licensed bar, BBQ, bouncy castle, exotic animals, slides, vintage cars, bikes, magic shows, balloon entertainer, crazy golf and much much more. The auction and raffle were very popluar and help to raise money for local community groups. The raffle is dependent on donations provided by local organisations, and this year DataSpace UK Ltd were pleased to donate of a FitBit – ready for working of all those holiday ice-creams!! Wincham School Family and Friends Summer Fayre opened at 1.30pm until 5pm at the primary school. The school had organised another great day filled with an action-packed array of activities and stalls including: A New Lego Exhibition, Bubble Football, Welly Wanging, Mega Slide and Bouncy Castle, Tombola, Face painting and tattoos, and many more!! There was entertainment in the arena throughout the afternoon with excellent displays from the school’s own Band and Choir, live music from Carlos Monteiro-Correia. Lots of yummy refreshments were served from the Tea Tent with tea, coffee, scones and cakes as well as soft drinks, a mouth-watering BBQ, and not forgetting the bar! At the end of the day The Grand Draw took place, with fantastic prizes. The 1st prize being a Samsung Galaxy Tablet. DataSpace UK Ltd have supported Wincham Community Primary School for the last few years and were pleased to donate a FitBit as a raffle prize this year! The money the school raises goes towards investment into the education and experiences of the children attending the school. We hope that our donation to the raffle helped sell even more tickets and this year’s total exceeds last years. It is a privilege for DataSpace UK Ltd to be able to support both these Wonderful Local Events! !